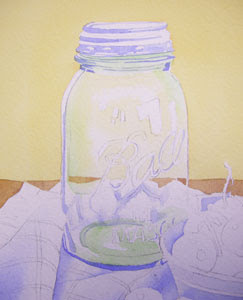 Today I have used Sap Green to add a wet wash of color to several areas on the jar. 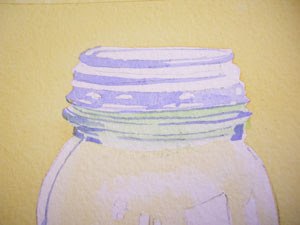 I have again used the softened edge stroke (see previous post) to create soft glazes. I have used different strengths of color (by using different mixtures of pigment and water) to develop some darker values and some lighter values. It's important to use your photo reference as a key. It will guide you as to where you need color, what shapes those colors should be applied, and how dark or light the color should appear. Because the previous glazes of color were bone dry, the soft application of another color on top of the previous layers creates a depth of color that cannot be achieved otherwise. When glazing several layers of color, be sure to use a very light touch and do not brush too much! Extensive brushing will simply lift and mix the colors and create mud.